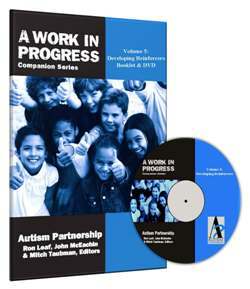 We are thrilled to announce the arrival of A Work In Progress Companion Series by Autism Partnership. The Companion Series consists of five booklets and DVDs that synthesize solid information on various teaching strategies with demonstrations of actual sessions with students on DVD. The goal at Autism Partnership is to blend a natural, child-friendly approach to teaching while remaining determinedly systematic. This series offers viewers the unique opportunity to see these approaches implemented in actual teaching environments. Parents and teachers will find this series to be a helpful companion and extension to A Work in Progress. 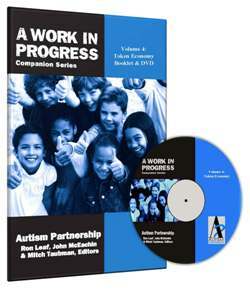 All author proceeds from A Work in Progress Companion Series will go directly to the Autism Partnership Family Foundation which was developed for three purposes: to provide services to families with limited resources; to fund research that will investigate new strategies and programs that truly make a difference in the lives of children and families; and to disseminate information about evidence-based treatment and provide resources for training parents and professionals. Volume 1 demonstrates the Cool versus Not Cool strategy. This is one of Autism Partnership’s most-used strategies for teaching students foundational as well as advanced social skills. Essentially, the strategy teaches students to understand the difference between behaviors that are socially appropriate (cool) and those that are inappropriate (not cool). In later stages they go on to actually practice the appropriate form of the behavior and receive feedback on their efforts. Research confirms the clinical experience that cool versus not cool is effective in teaching social skills and enabling students to monitor their own behavior. Volume 2 demonstrates the Learning How to Learn strategy. This is an underemphasized area in treatment and education. We often take for granted that students know how to learn or will acquire this skill on their own. But if students cannot pay attention, will not wait, or do not understand feedback, then learning is extremely difficult. In this volume, you will see programs described and demonstrated that have been found to be helpful in teaching students how to learn. Volume 3 demonstrates the Teaching Interactions strategy. The Teaching Interaction is an approach found to be especially effective with students who have more advanced language ability. It offers a conversation style of teaching which adds the all important element of leading students to understand rationales for why they might want to change their behavior and learn new skills. With Teaching Interactions, students develop understanding and insight that help develop their internal motivation. Volume 4 demonstrates how to effectively develop and use a Token Economy. Although token systems are commonly used in school as well at home, too often critical steps are neglected in their development. You will learn step-by-step how to ensure there is a strong connection between the target behavior and the reward that follows. Token Economies have a number of advantages and can be very flexible in adapting to the age of the student, the types of rewards used, and the skills and behavioral targets you are seeking to improve. Finally, Volume 5 focuses on Developing Reinforcers. The foundation of good teaching is utilizing powerful reinforcement so as to motivate students to learn as well as behave appropriately. This volume will show you how to be creative in developing new sources of reinforcement, which is especially useful for students who have limited interests. 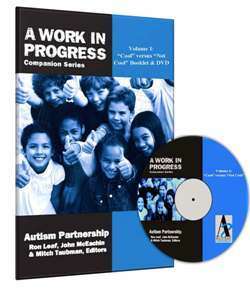 To celebrate the publication of A Work In Progress Companion Series, we’re slashing the price of each booklet & DVD from $29.95 to $19.95 apiece. And to make it even better, the Companion Series is the Pick of the Week so you can save an additional 15% by entering the Promo Code BLOGWIPCC at checkout. *Offer expires on May 8, 2012 at 11:59 pm EST. Not compatible with any other offer. Be sure there are no spaces after the Promo Code when you enter it at checkout. Written by: Different Roads to Learning on May 1, 2012. This entry was posted in ABA, autistic spectrum disorder, Behavior, Difflearn Promo Code, Pick of the Week, Products, Sale and tagged ABA, Applied Behavior Analysis, autism, autism education, Autism Partnership, autistic spectrum disorder, behavior management, John McEachin, language development, Mitchell Taubman, Resources, Ron Leaf, teaching, teaching tools by Different Roads to Learning. Bookmark the permalink.